Don Paterson (left) and Christopher Reid chatting to the audience following the reading. 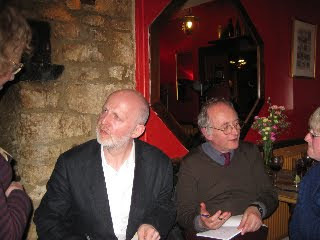 The Woodstock Arms was packed with over 70 people on Friday to hear Don Paterson and Christopher Reid reading their poems. Christopher Reid (Don Paterson's former poetry editor at Faber, who publish both poets) read from A Scattering, the collection about the death of his wife, his Selected Poems and unpublished poems written for a libretto about soldiers during the First World War. We were able to get hold of advance copies of Don Paterson's Selected Poems for the event, not published by Faber until early May - this is a great book, the best possible introduction for anyone new to his works. As Christopher Reid said during the talk, Don Paterson lives in the seventeenth century and produces metaphysical poems. He also produces sonnets - his next collection will, he said, be all sonnets, and he read some unpublished sonnets to us. We are very grateful to Tower Poetry for collaborating with us on this event: both poets were in Oxford earlier that day with local poet Peter McDonald to select the winners of the annual Tower Poetry Competition, a competition open to 16-18 year olds.